We are lucky today to be in a world where quality independent country music is the strongest it has been for decades, possibly ever. Whether you lean towards outlaw, cosmic, countrypolitan or singer-songwriter, honky tonk or bluegrass, there’s something out there for everyone. You can add Cliff Westfall’s album, Baby You Win, to that list. 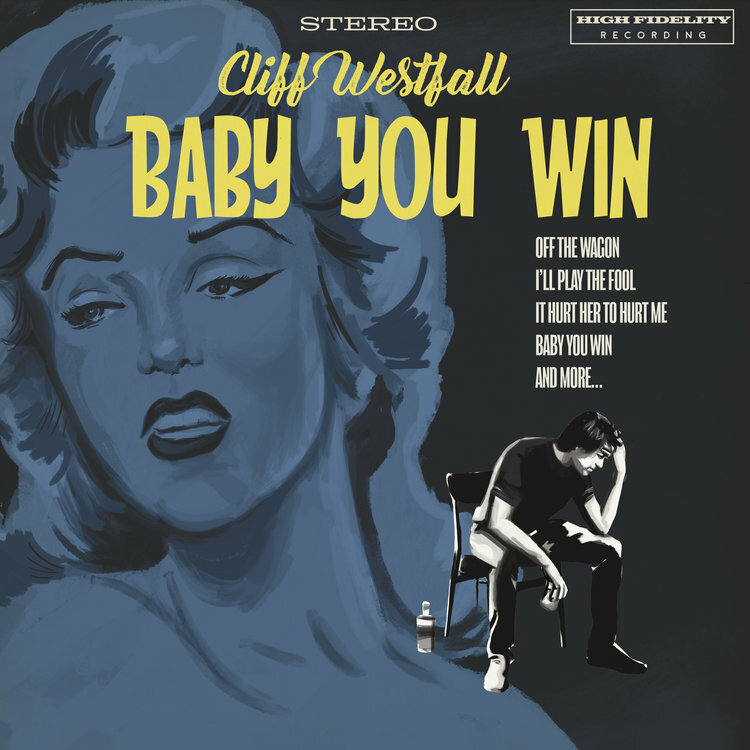 Packed with classic honky tonk sounds, with a production that manages to fell fresh and bygone at the same time, Baby You Win is reverential without falling into the trap of pastiche. Westfall’s lyrics are finely honed, at times wonderfully humorous, at others heart breaking, as only real a country songs can be. The press release helpfully prompts the busy reviewer that they should make some time for this album if they like Dwight Yoakam, Robbie Fulks or Rodney Crowell, and these are certainly good markers. Baby You Win does remind me of Fulks’s Georgia Hard album and Yoakam’s Guitars, Cadillacs, Etc., Etc., both albums I have gone back to time and time again, so I didn’t need much convincing. Westfall is a son of the south, hailing from Kentucky, the bluegrass state, although he calls New York home now. His band boasts so much experience, it’s no wonder they make such a fine sound together. The roll call of artists that members of the band have played with is impressive, if not daunting; Shooter Jennings, Norah Jones, Valerie June, Laura Cantrell, Ronnie Spector, Danger Mouse, Bruce Springsteen. Add to that producer Bryce Goggin, who has worked with The Ramones, Pavement and Antony and The Johnsons, and you have some serious talent in the studio. When deciding if an album should be reviewed here, the main considerations is whether it would fit in a Whiskey Preachin DJ set, or on the radio show. So, with that in mind, I was keen to find out if Westfall would deliver on our terms. The album gets off to a good start with a chirpy bopper, It Hurt Her to Hurt Me, followed by the twanging rock & roll of the title track, no surprise that Westfall cites Chuck Berry as a big influence. Till the Right One Comes Along drops to a shuffle, with a piano sound that brings to mind Patsy Cline, or Charlie Rich. So far, so good, all sounding very nice. I could play a lot of this on the radio, or when DJing in support of a band, but I’m not sure any of it would work in a full-on Whiskey Preachin DJ set. The next track, More and More, firms up my resolve that, while this is a solid, nice album, I won’t be needing to splash out on a vinyl copy. Just as I think I’ve got this one pegged, the next track, Off the Wagon, kicks in. A lovely funky twang is soon under-pinned by a rolling train shuffle and an infectious guitar line that pricks my ears up immediately. As the lyrics unwind themselves, I can’t keep my smile under control, I know I’ve found a WP winner. Then the lead guitar does its thing and the steel rips it up and I’m gone. No more evidence, your honour. A couple of tunes later, I’ll Play the Fool pulls a similar stunt on me, and I’m starting to hope that this album is being pressed up on vinyl, after all. Two sure fire WP tunes earns an album a place in the record box. I’m sold, even before a third winner, The End of the Line, kicks in to make this a three-spin album, making it all but essential. There are still two more songs to go, but, frankly, I’m happy for this baby to coast out, nice and easy, after all the hard work that has been presented so far. Well, I should know better by now, of course. Westfall closes out the twelve tracks of Baby You Win with a lovely drop of country funk, titled The Odds Were Good. That makes four solid Whiskey Preachin spins on a single album, and a body count that high raises a few eyebrows around here. But don’t get me wrong, just because there are four tracks that could happily grace any WP set, that’s not to say the rest of the album is a slouch. Far from it, this baby is packed with honky tonk goodness, from the first note to the last. Baby, we’re all winners here.